Business is now mobile. For smaller enterprises in particular, being able to work on the move is vital to their success. Indeed, a recent report stated that Wi-Fi access is now just as important as basic utilities. But it's not just now you need to plan for according to Gartner, enterprises will need to increase their deployment of Wi-Fi by 300 per cent by 2015 just to keep up with demand, so now is a good time to start planning for your future wireless access. Wi-Fi is everywhere according to a recent iPass report: "We have now entered the second-wave of Wi-Fi. It is everywhere: in our homes, in our offices, and at the majority of other places that we frequent. Mobile workers are taking advantage of Wi-Fi. 58 percent of mobile workers vigorously used Wi-Fi in a given day (more than two hours) on their smartphones, 73 per cent on their tablets, and 83 per cent on their laptops. 90 percent of mobile workers kept Wi-Fi on their smartphones turned on 24 hours a day." Indeed, research carried out by the Wi-Fi Alliance and Wakefield Research found that 97 per cent of Wi-Fi users believed their data was 'safe and secure', but when quizzed about what practical steps they had taken to protect their devices and data, only half of those surveyed has carried out any recommended security steps. What all this Wi-Fi access means is that paying close attention to security is now a commercial imperative that no business can ignore. For most enterprises the use of a VPN or Virtual Private Network will solve the many of the issues that surround the security of W-Fi connections. However, VPNs are not for all businesses, but this doesn't mean these companies are powerless to act. If you have a very small company yet want to take advantage of the security that VPN's offer, HotSpot Shield from AnchorFree is well worth testing. The system uses an application installed on each device which encrypts all data sent to their servers before then routing the data to its destination. There is even an app for your iPad and iPhone. It isn't a perfect VPN solution, but it's better to have some form of VPN running on the mobile devices your business is using than nothing at all. The security of a Wi-Fi connection is now vitally important to get right. In a recent report from the Wi-Fi Alliance, 40 per cent of respondents said they would rather trust someone with the keys to their homes than with their Wi-Fi password. 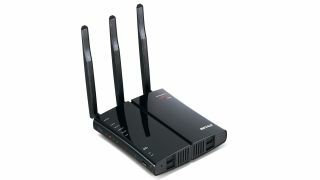 Look for products that are WPA2 certified - Wi-Fi Protected Access 2 (WPA2) is the latest in network security technology. It controls who connects to the network and encrypts data for privacy. Look for products that offer Wi-Fi Protected Setup - This security protocol has been developed to offer a one-touch setup for any new device that is placed on a network. Use public Wi-Fi sensibly - Your business' security policy should include detailed instructions about how to securely use public Wi-Fi hotspots that invariably have their security turned off. Turn off automatic sharing - Most mobile devices can be setup to automatically join any Wi-Fi network they are within range of. Turning off this feature gives the users control over which networks they use and thus, the level of security they have. Create strong passwords -The passwords that are often used with Wi-Fi networks are still too weak. Your company should give clear guidance on how secure passwords can be easily created and how they form part of the security protocols your business uses with Wi-Fi networks. Use a webmail system for email communications - Using a standard email client on a Wi-Fi connection may not be as secure as your business thinks it is. However, all webmail systems use HTTPS, which means your email is passed securely across the network. Gmail for instance now uses HTTPS for the whole email session. Use encryption with cloud-based services - The popularity of cloud-based storage means that businesses need to place these services within their security policies. Services like DropBox for instance use SSL AES-256-bit encryption. Check that the services your mobile users are using over public Wi-Fi are equally secure. Wi-Fi has clearly been a huge benefit to businesses within their offices and especially for mobile workers. Wi-Fi can be used securely if some simple rules are followed. Business should ensure that Wi-Fi security protocols are within their general data security policies and that these policies are communicated to everyone within the company.